The Musings of a Book Addict: Spring Reading Thing 2011 Is Here!!! 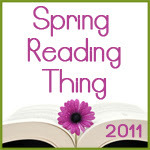 Spring Reading Thing 2011 Is Here!!! Welcome to my post on the Spring Reading Thing Challenge! I have many great books to read. If I finish them I will add more to the list as I go. I am an eclectic reader. I read for pleasure and research for my writing. I read for adults, young adults, and children. I want to know what is out there to recommend to people of all ages. That is why there is always such a variety of books reviewed on my site. Here is my list as I have it right now. They are not in any particular order. I've tried that in the past and found I got discouraged. I will not review all of these books because of the sheer number I hope to read, and also because some of them are research for 'my' book. I look forward to seeing what everyone else is reading and adding to my TBR pile. 23. The Ale Boys Feast - Jeffrey Overstreet. Lois Lowry is a great writer. I may need to pick up the one you listed above too. Lots of great variety, Sandra! I haven't read anything by C.J. Darlington yet, but I want too -- her books look good. And someone just recommended Book of Days to me...I'll have to check it out. Enjoy your spring reading! Wow, you are an avid reader! Happy spring reading! I, too, want to read These Things Hidden...looking forward to your review! I'm glad that you've already made some progress on your goal! !